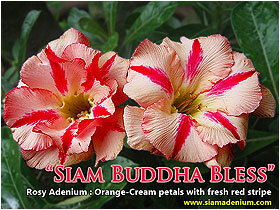 Our first release of Creamy-Orange Rosy Adenium in the world. Hello friends; Last time, I shared the ideas of making new colors and styles on Adenium flowers. This time, I would like to talk about the way of making the newest color never found in Adenium world before. 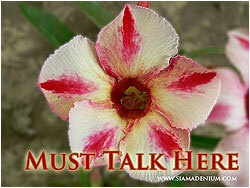 We often see Adenium flowers on red, white, and pink. These are just plain colors found in Adenium World. The color as I mentioned is “Orange”, the first release and biggest revolution in Adenium world. The concept of making this orange is like mixing color e.g. orange is come from red mix with yellow. After you get the color on your mind set, you can paint or brush more another color or style on it. This step is like putting some cosmetics on your face or new hair style to make better looking. Let’s get back to Orange Road. On the year of 2007, I found the Adenium variety from Taiwan that had some orange area on petal. She was our legend of making Orange called “The Peach”. On that time, we had not had many great varieties to cross with her to produce new varieties. Our goal was to make more orange spread more and prettier solid on petal. We crossed her with our “Golden Siam”, Hall of Fame of 2008, and came up with new variety name “Old Rose” on year of 2009. She was selected by better orange solid and plain color without any styles e.g. stripes, border, spots. The reason why we need to select the plain color is that we do need to keep the color’s stability without disturbing from these styles for next crossing generation. Now this time, “Old Rose” was our first ladder to put more new styles on her in order to make her more attractive. I always emphasize that “Single Petal” is the key to success of create new variety which has better quality on next generation and especially following with the new revolution of Adenium flowers with Multi-Overlapping Petals or we called “Rosy Adenium” at this time. Our new release of pretty solid orange Rosy Adenium in the world. The World's First Release Aromatic Adenium with cream flower. distinctive styles: “Must Talk Here” and “Sahara Smile”. “Must Talk Here” has orange cream color and red stripe (like mother) but no fragrance. “Sahara Smile” has yellow cream, cool fragrance but no stripe. We were pretty sure that orange would show up in next generation, you can notice this orange show in “Must Talk Here”. This is the funniest and most exciting thing of Adenium’s breeding. The Third Year: Creating Orange Rosy Adenium we could not use Rosy Adenium : “Dox Xon” to cross with “Sahara Smile” because her petal had not enough orange yet. 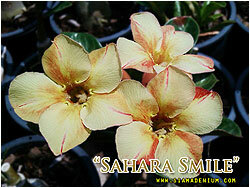 We need to create new variety of Orange Rosy Adenium before crossing to “Sahara Smile”. This time we used “Old Rose” as mother and crossed with “Rosy Adenium : “Dox Xon” and came up with Orange Rosy Adenium, I was so happy on that time. 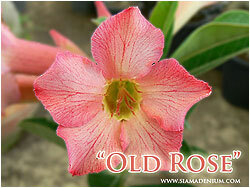 Her name was Rosy Adenium: “Siam Orange Rose”. The Fourth Year: Amazing happened on Orange Rosy Adenium with Fragrance now it's exciting time! 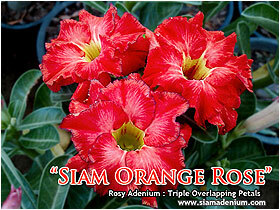 We used "Sahara Smile" as mother and crossed her with Rosy Adenium: "Siam Orange Rose". Believe it or not, this time it's success without waiting for next crossing's generation. The new baby came up with Creamy Orange Rosy Adenium, decorating with red-orange stripe and also cool fragrance as my wish. I gave her a name as "Buddha Bless" coz she was like god's gift from heaven. Now we are developing with new color, brown or like mangosteen peel. I will share you the idea of making this brown color later. The Flower Stability's Testing is alsom important. Sometimes flowers with first blooming or show on parents might not be the same with second or next blooming. I always make grafting this parent scions with other rootstocks. It will be great if you grow these rootstocks with natural organic media and fertilizer because colors would be look the same as parent's one. Chemical media or fertilizer will impact to flower color and characters after blooming. I think this could be good example of Adenium developing and worth with patience for 4 years. I doubt that this must be very fun for you especially with breeders. Don’t forget the most important thing; “Single Petal” quality is a key to success of producing both nice single petal itself and multi-overlapping petal (Rosy Adenium. “Why do you have to be like others”? Have a great day. 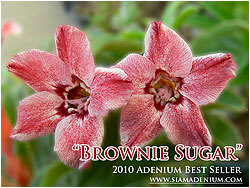 Another new adenium color with brown, she iis being developed to become Rosy Adenium.